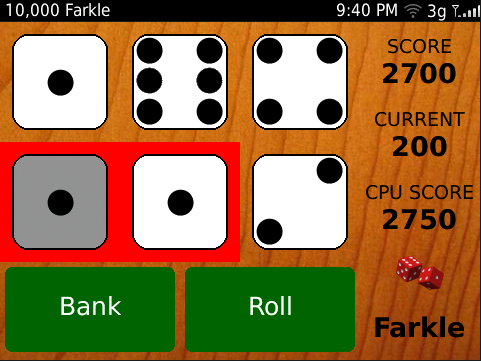 10,000 Farkle has been updated to version 2.0 in BlackBerry AppWorld. 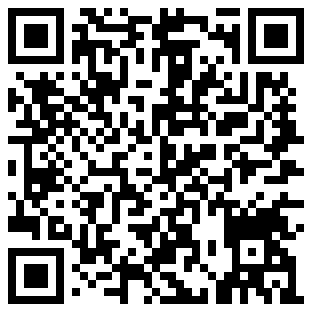 This new version integrates with BBM to add the ability to play multi-player games. The default game mode gives you 10 turns to score as many points as you can. The 10,000 point mode is the traditional way to play, where the goal is to reach 10,000 points in as few turns as possible. The competitive game modes (“vs Friend”, “vs Computer” “vs BBM Friend”) all use the traditional race to 10,000 points. To play against one of your BBM friends, you first need to change the game mode in the menu to “vs BBM Friend”. You will then have the option to start a new game against one of your friends on BBM. It is required for both of you to have the game installed, so there is a second link that you can use to invite your friends who don’t yet have the app, to download it from AppWorld. 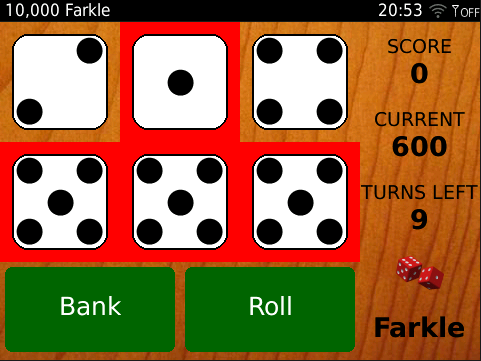 The game then plays under the traditional rules, with the first over 10,000 points as the winner.